I had planned to have an update tonight - but still have so many things in the works… won’t be ready on time. So - next week, be on the lookout, there should be quite a bit of goodness here. Hmmmm. 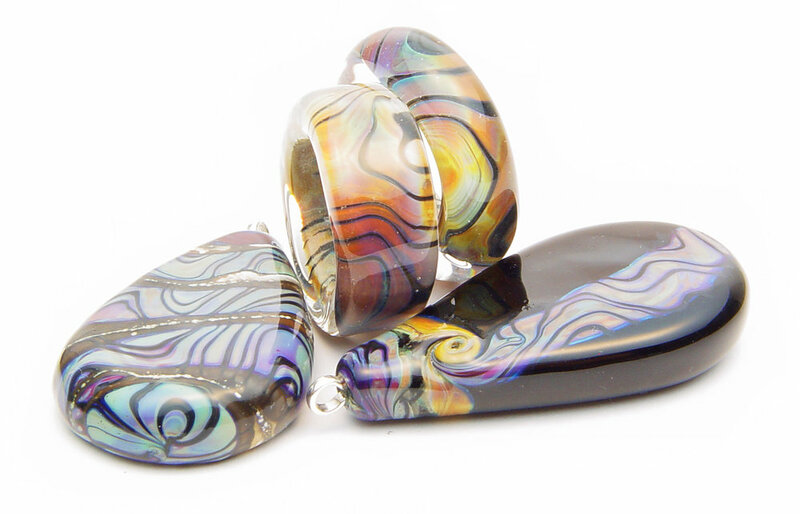 it seems that over the years my beads are happiest when paired with compatible other bead shapes - not so much applied designs… lending an overall contemporary feel to much of what I produce. Are there limitations? 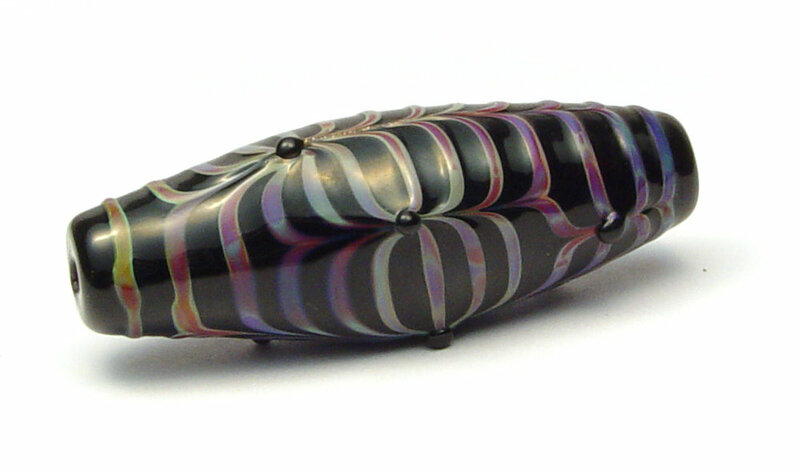 This is a gorgeous glass toggle… shouldn’t the clasp be as pretty as the necklace? and yes, I’m still exploring the bead without the hole… and its many applications. …or the hinged pendant allowing movement, a visual variety of compatible shapes, and a nice merging of colors, texture and design elements. Big bonus is it creates a larger scale finished piece - when otherwise I am not so inclined to make bigger pieces. oh… and how about this one??? If one is good, but leaves something to be desired - maybe it could use a little help from its friends? Sure. This is the glassy version of a tassel… it’s called a “glassel”.. : ) Three distinct components - non stand-alones… paired up to create a showstopper. Often larger beads are clunky - and I worry about the sheer heaviness… this one has two hinged joints that allow for it to move… and allow its wearer to fiddle with it… I like that. I have fallen into the abyss of shaping these past six months or so - and love how the photograph above shows the perfection of a sleek unwavering line on the black tassel… The decorated barrel needed some punctuation - and I think by pulling the blues out on top and emphasizing the black in such a dramatic way - I achieved this. 3.13.2019 - Loving my Torch Time! I don’t know if it’s the change in season (80 one day, then 30 the next) or what… but I’m all over the place. I’ve been trying some new things and didn’t have enough time tonight to get it all on the page, so I guess I have a leg up for next week! As I sit at my desk, I keep striking the wrong keys on the keyboard - because I have limited myself to space… I’ve got projects going on all sides… projects that will emerge next week - I get tripped up on the finished items so often because they’re more labor intensive than I anticipate, and while I always have a blog on Update Wednesday, the actual page is really the push. SO… that’s why this is coming to you now. I need a bowling ball? Nah… these are human sized, and similarly shaped… and currently sitting in a bath of liquid silver polish - that will take the rest of the reduction off… this turq. glass silvers up if given too much heat… and it does come off - if it were consistent that’s one thing… but - patchy - me no likey. First. Remember Charlie? We’ve not talked about him for awhile… I took him off of kibble and started giving him real food. Raw chicken, spinach, peas, carrots, brown rice, raw egg, vitamin supplements… some days he gets quinoa instead of rice, or broccoli instead of carrots… every meal is exciting for him, and he cleans his bowl. Charlie’s energy level has changed and he has lost about 10lbs. He IS fluffy… and looks larger than he actually is… but in the past month he has slimmed down. What’s good for the goose is good for the gander, eh?? I’m in a timeframe where I’m rethinking certain beady issues - so I’m taking a break from writing about the glass in my life. I wanted to tell you about some trees I’ve been watching for about 4 years. I drive by these every so often - and have kept a rather timeline on their different moods. Funny how things have moods… I often talk about how much fun it is to photograph the beads - and how they develop photographic personalities. … that makes me smile. Visited this golden eyed beauty at the Animal Shelter a few weeks back… isn’t he a beauty??? Can you say HOT HOT HOT? I can empathize with the cold temperatures… know that in TX we get cold too - after being treated to 86 degrees last week (for a day), the temps dropped to the low 30s. This is the norm for Feb/March - it found me hunkered over my torch and backed up to my kiln… with a ceramic heater blowing on my feet. Brrrr. But out of that came these beauties. It’s such a timely design jump - as the graffiti park has been closed. I KNOW I wrote about it recently - it just is a very cool place & such a shame it was closed down. Wouldn’t it be fun to wear beads that represented the area of the country you live in? I’ve been playing around with an idea and ended up here… this too will evolve - but wanted to give you a heads up… and see what you thought!? 1.30.2019 - 1/12th of the year gone ALREADY? I blink and lose a month. While the rest of the nation is in what seems to be a deep freeze, Texas is holding its own… granted it’s not sweltering here (today)… it has been chillier than the norm. Makes one glad to have a torch or two to cozy up to. Big cheesy grin. I had a small bump on the creative front this week - happily so. Now, to see what else I can make with it. I bought these shards online - and am still trying to figure out what they will do… but - So far - am loving the look!! 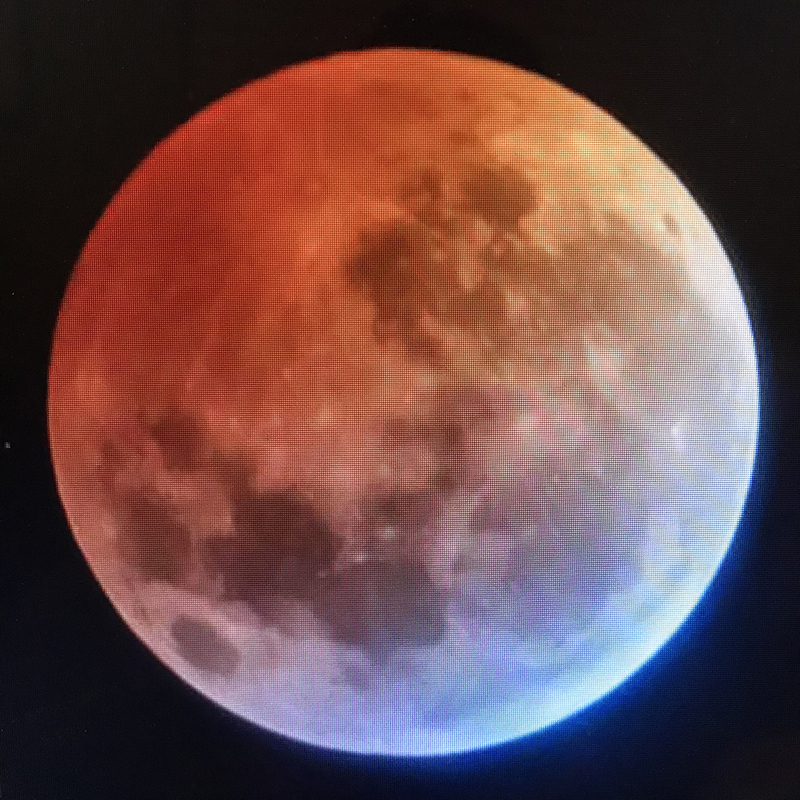 1.23.2019 - Super Blood Wolf Moon... EARRINGS?! I’ve been admiring the way the glass has striations and layers of color… I had no idea that the moon would copy!! Goes to show you that you should always be on the move - with new ideas and things - because there’s always someone/something out there looking to take your ideas. I had to laugh - as even the Jetstream trails that showed up early in the evening reminded me of the JETSTREAM silver trails I’ve been using in my bead series for years! All kidding aside, it was an awesome sight and made me feel quite big in our awesome universe… as the Earth could project a shadow on the moon that would totally cover it! I hope you had an opportunity to see the eclipse - word on the street is that the next eclipse will be in 2021. Probably nowhere near as awesome (great viewing conditions) as this one was!